It's the MOST WONDERFUL TIME OF THE YEEEEAR! 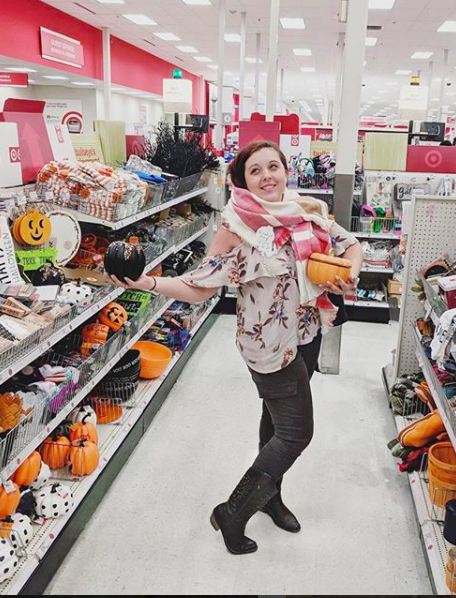 I feel like people can be divided into two groups: Christmas people, and Halloween people. Um, and I guess Nightmare Before Christmas People that incorporate both... so maybe three kinds of people. I've already enjoyed my first PSL of the season. And am slowly accumulating various Pumpkin Spice treats to try. So of course, I was going to try my hand at some seasonal French Macarons. 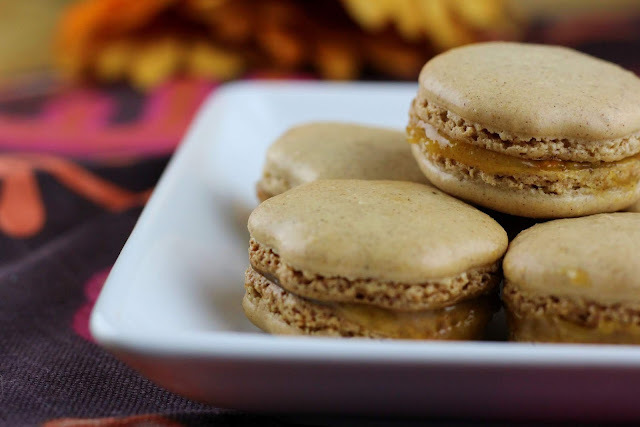 Spiced orange French macarons, to be exact. While these don't actually have any pumpkin, they DO have a hefty shake of pumpkin spice. With the accompanying Spiced Orange Curd it's the perfect treat for when the air gets chilly and you need something cozy to munch on. Bonus: the egg yolks you separate from the whites go into the orange curd! It's really quite perfect. Don't get discouraged if they fail the first time--these cookies are VERY temperamental. The good news is that even if they don't LOOK like macarons, they'll still be tasty! -Sift together the confectioner's sugar, pumpkin spice, and almond flour. -In a stand mixer on medium, whip the egg whites and cream of tartar until frothy. Turn the speed to high, and slowly stream in the granulated sugar. Whip until stiff peaks form. Add the vanilla extract and mix until just incorporated. -Add the almond flour mixture and fold into the egg whites until well combined. The perfect texture is described to be like "lava"--it should flow slowly off the spoon when pulled from the batter, and look shiny when at rest. -Using a piping bag, pipe 2-3" diameter circles of the batter onto a cookie sheet fitted with parchment paper or a silpat. Smack the pan on a hard surface to remove bubbles, then let sit at room temperature for 10 minutes. -Bake for 20 minutes, until cookies are shiny and small "feet" form. -While the cookies bake, prepare the orange curd: In a pan over low heat, mix together all ingredients and whisk constantly until thick, about 12 minutes. It will further thicken as it cools. oh I have failed many times at these types of cookies, I just cant make them right Yours look perfect and I know they must taste great too. Oh God, I adore Macarons! I can eat them every day. Yum Yum Yum! Looks so vibrant and lovely! I can't WAIT to try this! Thank you for this great recipe! They are perfect!! Perfectly wonderful lookin, perfectly wonderful sounding, and I imagine perfectly wonderful tasting!! These lovely macarons would be ideal on a dessert tray for Thanksgiving. I agree, I also love everything pumpkin this time of year. These macaroons look amazing, I'll have my daughter try her hand at this recipe this week.